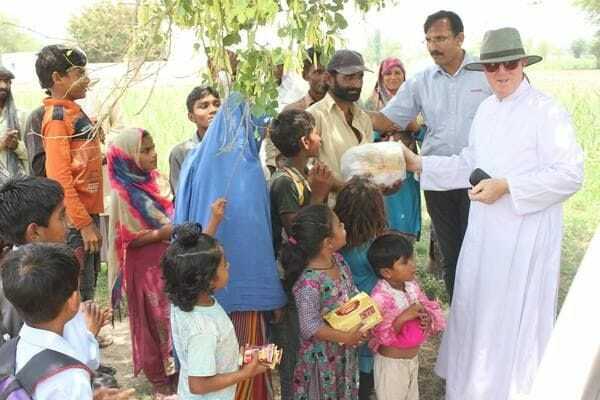 Young Lasallians from schools in Faisalabad have offered support through food packages for bonded labourers during a visit to a brick kiln on the outskirts of the city. The workers live in appalling conditions and are forced to work permanently to pay off crippling debts to their employers. They are generally uneducated and left with few options, caught in a vicious cycle of poverty. They often accept whatever pay is offered to them in exchange for years of bonded labour and are not covered by labour laws because of the casual, informal nature of their work. More than two million people are enslaved in bonded labour Pakistan and the problem is most severe in the Punjab and Sindh provinces. The sale and purchase of brick kiln labour has become a profitable business. "Peshghi" or bonded labour is being transferred from one generation to the next and is particularly common in the brick kiln sector. It was a good opportunity for the Young Lasallians from Faisalabad to see this form of poverty first hand and to offer support to the workers and their families. They were able to visit ten families at the brick kiln and worked alongside Br Aloysius Hurrell to distribute food packages to them. It was a great demonstration of Lasallian spirit, drawing upon the inspiration of the Founder to reach out to those in greatest need.